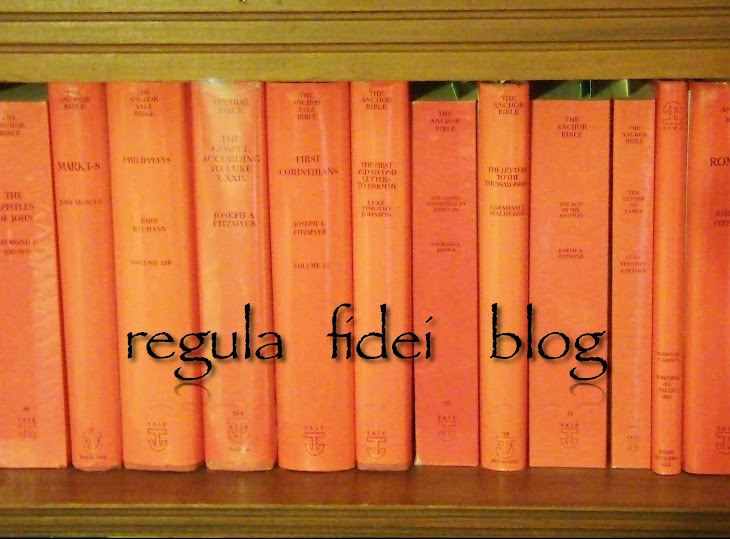 r e g u l a f i d e i: Some Thoughts on a Hodgepodge Mess. Some Thoughts on a Hodgepodge Mess. "I have been for a longtime pondering this Catholic (using the current understanding of the word) vs. Christian argument. I haven't reached many formal conclusions. The subjects are vast and time consuming... time I rarely have it seems. I have generally kept myself confined to the history of Christianity, and now I am trying to read one by one the Anti-Nicean Fathers. Prior to this I was working through a History of Christianity, but I felt as though I had gone to far in time (in the book), and that I needed to back up to actually read more exactly the documents that tell the tale. Until now, I was interested in specific points of interest. Now, I am setting out to read this large body of work. I have no idea when I will finish. I plan on when God and money allows me to purchase these writings. I will say that I have had some shift in thinking of recent. I have questioned what I have always excepted as the truth. I am willing in this journey to be proven wrong on many points. I trust God will lead me with His Holy Spirit. I rest in that, and feel no need to rush into decisions about anything. I feel as though God has given me a teachable spirit, and yet one that wants the whole truth." If only we could all be this honest and sincere in our quest for truth! The Church is the bride of Jesus Christ, the God-man who came to die for us when we were yet sinners. The Holy Spirit is He who leads His children into all truth concerning His Church. The Father is He who draws all whom in humility and tears seek the ways of His historical Ecclesia2. The point being that the son that sincerely seeks, the Father will reveal in His appointed time and in His appointed way3. As far as studying church history one must understand and realize that every work written on the subject is biased by definition. If you read or hear an overview of Christian history from say a Calvinist standpoint - you are going to get a skewed look on the fathers and the development of doctrine4. The point here being that you must study both sides of an issue (from the primary sources) to make an intelligent decision. ANF volumes by Schaff are a surely a massive collection of patristic sources but I have found explanatory notes on occasion to be bent in a Protestant direction at times. The Catholic counter work to ANF is William Jurgen, The Faith of the Early Fathers 3 Vol which is an equal treasure trove of the primary writings of all the Catholic Fathers of the first five centuries (including the heretics). Here the fathers are allowed to talk for themselves in full context5. "Additionally I have been reading here and there bits of info on two different theological systems. On the one hand Dispensationalism (which has a variety of forms) and also Covenant Theology. The two points of view ask interesting questions and yield even more interesting results. Both seek to be true to scripture, and yet both have some clear distinctions. It should be noted however, that people from both camps look at each other as brothers. They agree to disagree in general, and there is Christian unity. Both can worship together and enjoy fellowship with each other." Actually from my own research on this hotly debated issue among Protestants, I get the feeling that the two systems are mutually exclusive and strong language has been used to denounce eachothers positions6. "My mind is swirling. I haven't had a successful string of thoughts on any of these topics for weeks. I have also found a solid resting place in the Holy Scriptures. There, in black and white I am at ease. I have recently started to read from front to back. It is good to take in in detail all the stories I have heard many times over since my youth." These topics are not an easy problem to overcome. And yes we can take flight to the Holy Scriptures when the pressing questions become too much. On the other hand, we have the regula fidei, the interpretive tradition of the Catholic Church for 2008 years now that we can also cling too when we feel the suffocation of a myriad of systems of theology - all claiming to be the correct one. "But you are blessed, who by faith are in the Church, dwell upon the foundations of the faith, and have full satisfaction, even the highest degree of faith which remains among you unshaken. For it has come down to you from apostolic tradition, and frequently accursed envy has wished to unsettle it, but has not been able7. " 1. http://pathoftheweis.blogspot.com/2008/05/hodgepodge-mess.html. A beautifully rendered blog site by George Weis. The questioning in this article is so refreshingly full of existential angst. Tim Troutman (former PCA Protestant, now Catholic) likewise has responded to Weis' post at his thoughtful blog - http://godfearin.blogspot.com/. 2. Of course I do not relegate these particular traits to each of the "persons" of the Trinity as mentioned. These traits are seen to overlap among them (for a defense of the unity of will in action among the Trinity in the regula fidei, see the Cappadocian fathers). 3. My story in many ways mirrors the quest by Weis. I was born, baptized, raised, confirmed and first-communioned as a Roman Catholic in a long line (dating back to Spain) of Catholics. However being Catholic in name only for the first couple of decades of my life - I "found" the Lord in an Evangelical church. As I matured both in age and in my study of historical theology my quest took me in Protestant circles from a free church evangelical, to a reformed Calvinist, next into the Anglican church. You can see how my development of historical theology dovetailed with my interests in my choice of ecclesiology. Now in my second half of life and through many tears, I have submitted my will to the clear and pristine voice of the Triune God in history. I now chant the ancient devotional hymns of worship in the historic Ecclesia Catholica. 4. An example of this is the lecture series on church history by the late Calvinist John Gerstner. 5. Faith of the Early Fathers is the best resource for the overall interpretation of the regula fidei of the fathers en toto in my opinion. The doctrinal index which categorizes doctrine in a systemized way would be worth the price of the three volumes alone. 6. Starting with O.T Allis Prophecy and the Church, the all out attack on Dispensationalism as a serious theological error has continued unabated. The late Presbyterian professor of church history John Gerstner also mounted a heavy critique of dispensationalism, followed by the excellent critique of dispensationalism in the mid 90's by Keith Mathison. I have seen no real responses by the dispensationalists to these in depth reformed critiques. Progressive Dispensationalism and works like it have surfaced but these are not counter works but simply spell out differences and "progressions" within the dispensational camp. I still find this task daunting. I get some time every week to go a little further in my reading, but it never seems like enough time. I do my best to read without a bias, so I actually see things that at first look would appear to support a number of currently held views... Specifically with the Eucharist. I see you mentioned Keith M. I understand he has a very good book on the subject. I would like to get my hands on that. I do at times retreat to Scripture, but I feel no shame in that. It teaches, reproves, corrects, and trains in righteousness. With that revival of the mind and soul, I feel able to tackle once again the task I endeavor in. I would thank you to keep me in your prayers. I do indeed trust the Lord in all things. However, weather that will take me in the same direction as you have I cannot say. I do see many ways in which the Catholic Church reflects the earlier Church (I know what you would say to that A=A haha!) However, it is the developments of some issues that I am not sure about. So I keep digging! Thanks brother... your thoughts are welcome! Good luck with your quest brother. I have not have a chance to interact with Mathison on the Lord's Supper but I'm sure it is solid from a Reformed standpoint. Make sure to read Catholic work's on the Eucharist as well such as, "The Hidden Mana: A theology of the Eucharist" by James O'Conner. Scripture is as you say always refreshing to flee too. I try to find time every night to devote some readinf of the Sacred Scripture.